In the future drone aircraft will sustain more gravity forces than the human body can withstand. Drones can already stay deployed longer than a human can stay awake. The F35 maybe the last strike fighter with a pilot in the aircraft. 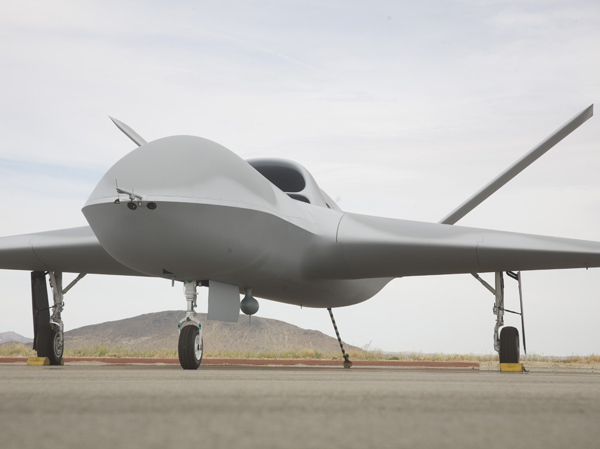 A new, low signature, unmanned aircraft all designed using Pro/Engineer wildfire, the long-rumored, 20 hr.-endurance, pure-jet Predator C Avenger has emerged from General Atomics Aeronautical Systems workshops after a 3½ year gestation period paced by massive growth in UAV production and the use of unmanned designs in combat. The UAV’s undeniably stealthed-up exterior offers several clues about how the aircraft could be deployed. A weapons bay allows internal carriage of 500 lb. bombs with GBU-38 JDAM tail kit and laser guidance. Given the aircraft’s 41 ft. length (which will expand by at least 2 ft. in the second test aircraft), the weapons bay appears to be 10 ft. long. The weapons bay doors can be removed to allow installation of a semi-submerged, wide-area surveillance pod, says Tom Cassidy, president, General Atomics Aeronautical Systems Aircraft Systems Group. Cassidy has earned a unique reputation by using company funds to develop what he believes the military needs rather than chasing Pentagon requirements that shift with disheartening regularity to produce cost increases and production delays. The result is a family of Gnat and Predator designs that are used by all the services and intelligence agencies. The Predator C, like the B-variants, is designed to carry about 3,000 lb. of weapons and sensors. In a non-stealthy environment, weapons could also be attached externally on the fuselage and wings. For an additional 2 hr. of flying time, fuel tanks can be installed in the weapons bay. Normal fuel storage is split 50/50 between the wings and fuselage. The Avenger’s electrical power is expected, at least initially, to be less than the 45 kva. available on Predator B variants. A long, featureless underside provides a low-distortion design for carriage of a wide-area surveillance sensor such as an all-weather, active electronically scanned array (AESA) radar. The wide-area surveillance system to be provided by the Air Force has yet to be defined. However, it would be carried by a specialized all-reconnaissance version of the Avenger. A Lynx SAR is likely carried in the lower part of the nose. Absent from the prototype is the EO/IR sensor turret used by the Predator family. A retractable installation may have been developed. The vertically-oriented V-tail both deflects radar and shields the 4,800 lb. thrust Pratt & Whitney Canada’s PW545B engine exhaust’s infrared signature. Predator C has two all-flying tail surfaces with two servos each for flight-control redundancy. The humpbacked design of the engine compartment offers room enough for a serpentine exhaust that eliminates radar observation of the engine. Pratt & Whitney has been developing an S-shaped exhaust that offers protection from radar observation and cooling to reduce the IR signature. The engine is expected to provide an airspeed of at least 400 kt., but Cassidy says envelope expansion tests may produce speeds considerably greater than that. Its operational altitude is up to 60,000 ft. The Avenger’s 17 deg. swept wing (66 ft. span) and tail edges are all parallel in plan view with one or the other leading edges. It is the same shaping discipline used on classic stealth designs like the B-22 and B-2. The cranked trailing edge provides the aerodynamic and structural benefits of a tapered wing and helps shield the engine inlet from radar. Canted upper and power body sides meet at a sharp chine line, continuous from nose to tail, thereby avoiding the radar cross-section hot spot caused by a curved side. The thickness and curvature of the inboard wing are noteworthy, pointing to an effort to achieve laminar flow over as much of the wing as possible. The prototype carries tufts over the left wing/body junction that allow engineers to visualize airflow in that area. General Atomics Aeronautical’s parent company includes a division that produces materials for controlling radar, optical and infrared signatures. Adjacent to the company’s Rancho Bernardo, Calif., facility are the world’s largest indoor radar cross section testing ranges. Likely challenges would have included building a ‘bandpass’ radome for the satcom antenna above the nose. It must be transparent at the Ku-band used by most airborne satcoms, but opaque at lower frequencies used by fighter and missile radars. Again, that capability mimics the F-22 and F-35. The aircraft was designed so the wings can be folded for storage in hangars or aircraft carrier operations if a naval customer is found. Cassidy, a retired admiral, has talked about a possible Navy role for Predator C since 2002. The Navy was interested in the Predator B’s capabilities, but didn’t want to introduce any new propeller-driven aircraft onto carrier decks. The UAV also comes with a tailhook, suggesting that carrier-related trials are planned. The inner section of the cranked wing is deep, providing structural strength for carrier landings and generous fuel volume while maintaining a dry, folding outer wing. Right now, the U.S. Air Force and Royal Air Force are considered the most likely users. The Avenger has landing gear from the F-5 aircraft and anti-skid brakes. It uses a laser altimeter and a vertical indicator has been added to the head-up display. At 100 ft. the laser altimeter comes on. If the pilot puts a ‘caret’ in the middle of the indicator it will keep the aircraft at a proper pitch for the landing and eliminate pilot-induced oscillations caused by the parallax effect between a pilot’s vision from a manned aircraft pit and that of the UAV’s on-board visual sensor. The Avenger made its first flights Apr. 4, 13 and 14 in a test program that is slated to last 2-3 months. With customer funding, in 10-12 months operational aircraft could be rolling out of General Atomics Aeronautical Systems’ new, expanded production facilities in Poway, Calif., that opened four weeks ago, Cassidy says. Predator A and B production had been occupying the company’s Rancho Bernardo facility, but two factors have left plenty of room for manufacturing the Avenger and what’s being described as a highly modified Predator B-plus design. First, Predator A production is being phased out as more advanced models are fielded. Second, six buildings have been acquired at the new Poway facility with 1.2 million sq. ft. for manufacturing, about three times that at Rancho Bernardo. The research and development facility at Adelanto has also doubled in size. The composite fabrication facility remains in Sabre Springs. While company officials won’t discuss their investment in the Avenger program, they will say it is about twice what they spent to develop the Predator B, primarily because it took longer. 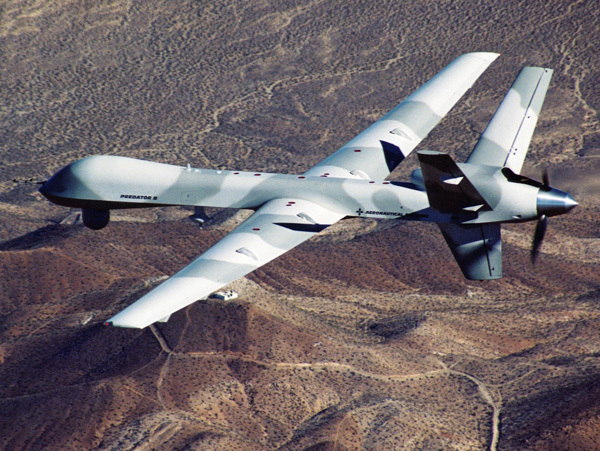 The piston-engine Predator A (MQ-1) first offered long endurance and a weapons-firing capability. The turboprop Predator B (MQ-9) greatly increased the weapons payload, speed and operational altitude. The Predator C now adds additional speed for quicker response and rapid repositioning for mission flexibility and survivability. With first flight of the Predator C and plans to start cutting the manned aircraft force structure, opponents are gearing up to object. In a roundtable for reporters, Marine Corps Gen. James Cartwright, vice chairman of the Joint Chiefs of Staff, revealed a vision for a new tactical aircraft force structure that includes a high, medium and low cost and performance mix of aircraft wrapped around the F-22 Raptor, F-35 Joint Strike Fighter and armed UAVs like the turboprop-powered Predator B Reaper. 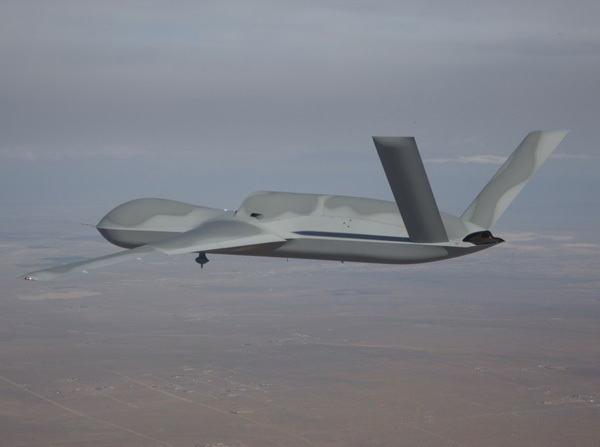 However, the Reaper, unlike the manned Raptor and JSF, is not low-observable. In contrast, the Avenger’s signature has been reduced through shaping and elimination of a propeller. The tactical force structure would be supplemented with F-16Cs, F-15Cs and F-15Es upgraded with active electronically scanned array (AESA) radars that increase radar ranges by 2-3 times and allow detection of small, even stealthy objects including cruise missiles, stealth aircraft and very small ground targets. Opponents see a threat in the decision by Defense Secretary Robert Gates and Cartwright to include armed UAVs within the fighter force structure. Critics view this as a first, false step driven by economic rather than military considerations that will lead to the substitution of Reapers, and later Predator Cs, for F-35 JSF’s, says a long-time fighter pilot, acquisition official and senior Air Force leader. However, this does overlook a basic planning element in the JSF program from the start: that the stealthy strike aircraft would be pitted for competitive reasons in later production lots against unmanned combat aircraft. If you are an engineer and dream of working for a company such as General Atomics, you would need to first know Pro/Engineer 3D solids modeling software from PTC. It would help also if you had a specialty with a specific Pro/E module such as Mechanica, harness design using Pro/Cable & Routed Systems Designer, Pro/Surface, and Mechanism. If you are a Detroit Catia or Unigraphics user, consider taking a class at Design engine. The Design Engine Four Week Pro/Engineer Comprehensive workshop that starts the first full week of each month in Chicago is a great way to quickly become an expert at Pro/Engineer then leverage your automobile experience with Aircraft. 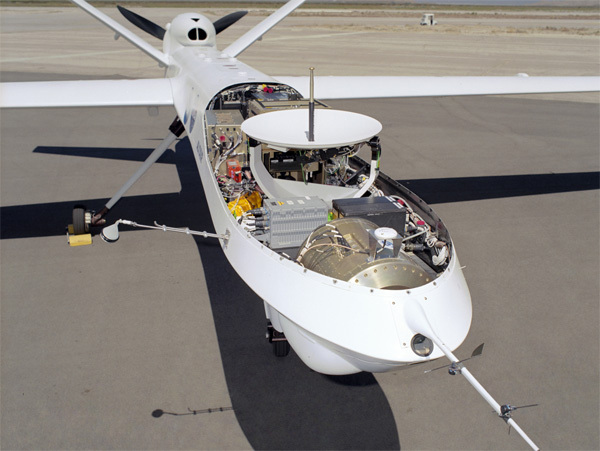 General Atomics has taken a multitude of workshops from Design Engine over the years so as you can imagine Design Engine has an established relationship with General Atomics Management. Design engine also works with specific permanent placement agencies which offer a direct route to employment.